Do you have a driveway which looks shabby compared to your neighbor’s? Do you feel embarrassed each time you pull up in your driveway? I am confident, you want to boost the appearance and cure appeal of your home without forking out lots of money Then you need to try out pressure washing! In this article, you will find a step-by-step guide on how to pressure wash concrete driveway or brick driveway. You will also get pointers on how to clean concrete driveway mildew, and the best tips for pressure washing concrete. Read on below! When it comes to concrete driveways, dirt, oil, and debris can build up over time and form a sticky and grimy film. 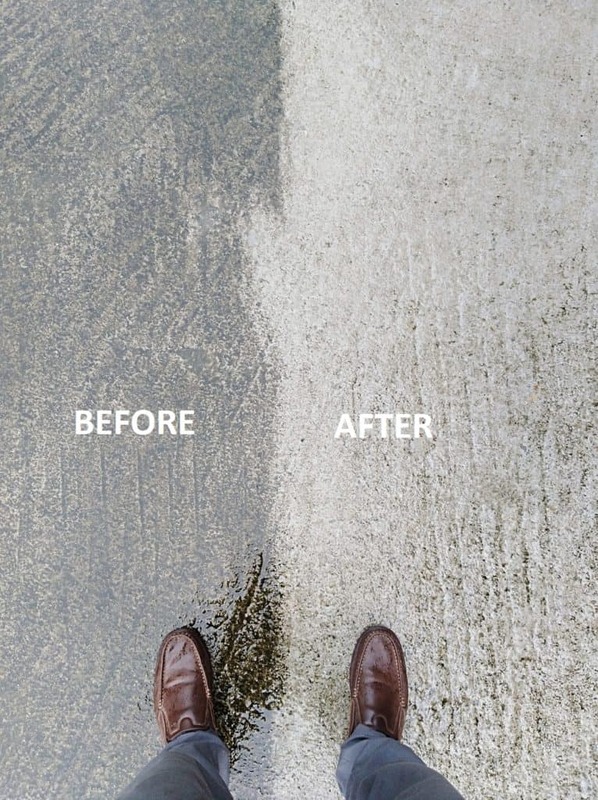 With daily usage, your nice new driveway can start looking grubby pretty fast. In turn, this reduces the curb appeal of your home and makes it less welcoming and attractive. A new driveway can be pretty costly, so you may be wondering abo cheaper alternatives. Well, the best option is to simply maintain the appearance of your driveway on a regular basis. This helps to make your driveway more presentable and shows that you take good care of your home. It also saves you thousands of dollars in renovating your driveway. 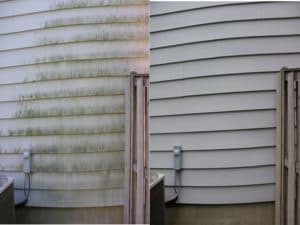 However, not all methods of cleaning are efficient enough and this is why many people are turning to pressure washing. One of the benefits of pressure washing your driveway is that it won’t cause damage to the concrete, unlike chemical-based cleaners. It can also be done very quickly and easily, removing months, if not years of dirt and stains, revealing an almost brand-new looking driveway. This can be done in as little as an hour in most cases. It is up to you how often you want or is able to clean your driveway, as pressure washing can be done at any time. However, you may wish to consider a mandatory summer cleaning session when algae growth is most apparent. Now let’s take look at the steps for pressure washing your driveway. How much pressure is needed to clean driveway? Your concrete or brick driveway is not sensitive like car, deck or exterior of your house. For the household cleaning or car cleaning a pressure washer with 1500 psi is good to go. But, to clean your concrete driveway, you need at least 3000 psi of pressure. A GPM of 4 is very good and perfect with a 3000 psi pressure washer. Driveway can be covered with stubborn mildew, which is really tough cleaning with a low-pressure washer. And yeah! Those are my legs and shoes. These steps should help get rid of mildew, mold, dirt, and other nastiness lurking around your concrete driveway. Gather and set up all the necessary tools and equipment required for pressure washing. You will need a pressure washer, detergent, high-pressure hose, soaping nozzle, rotary nozzle, surface cleaning attachments etc. Clear your driveway of any vehicles or other obstructions. The area should be clear and empty so you can clean it freely and thoroughly. Turn the spray nozzle to 25 or 40-degrees and attach it to the high-pressure hose. Then turn on your washer and spray down the surface of your driveway. This will help clear away loose debris such as twigs, leaves, pebbles, etc. If you are using detergent, then add it to your washer now. Please consult your machine manual before selecting a detergent which is compatible with your washer. It also needs to be suitable and effective enough for cleaning concrete surfaces. Now it’s time to attach the soaping nozzle and turn on the washer. Soak the entire driveway with the soap and leave it to do its thing for 10 to 15 minutes. This helps to break down dirt, mildew, stains etc. After the concrete has soaked up the detergent, it’s time to blast away the baddies! You may wish to use a cleaning attachment for this stage of the process. A cleaning attachment helps to clean the area faster and more effectively, as it disperses the water in a pulsing flow and covers a larger area. This helps to prevent damage to the concrete, as well as blasting away the dirt. Now attach a rotary nozzle to lift away more stubborn stains and ingrained dirt. A rotary nozzle employs a similar method of pulsing/rotating the water as a surface cleaner and is designed to be gentle on your driveway. Your driveway should now be clean of dirt and debris. Now give it a final rinse with a 25-degree nozzle to flush away any remaining detergent and you’re done! Always read the user manual that comes with your washer and follow the instructions carefully. And always use the manufacturer recommended detergent for your pressure washer. Make sure you direct the spray away from any plants that may be around. Also, do make sure you have some kind of drainage system for the water to flow to, so it doesn’t clog up somewhere or enters a drain which leads to a stream or similar. That would be environmentally hazardous due to the chemicals in the detergent, as well as the filth you’ve just washed off. So please be mindful and respectful of your local environment. High-pressure water should be used with caution. Using a surface cleaner helps to reduce risks as it contains the flow of the water within the unit. Always wear protective clothing, gloves, and goggles when using a pressure washer, for safety. When purchasing a pressure washer, you may wish to keep some factors in mind. These include price, ease of use, maintenance, portability, durability, and power. For the washing of brick and concrete driveways, the most important factor to consider is the GPM. This determines how fast you can complete the job. Gas powered units are usually faster than electric ones. To clean concrete driveway mildew that may be more stubborn, you may treat it separately before pressure washing. Simply fill a bucket with 2 gallons of water and add 1 cup of chlorine bleach. Make sure you wear rubber gloves to protect your hands. Then using a stiff bristled broom or brush, dip it into the bucket and apply the chlorine bleach mixture to the affected areas. Make sure you apply enough to cover the growth and let it sit for 15 minutes or more. This will ensure that the bleach has enough time to kill the growth. After this, scrub the mildew vigorously with the brush in order to loosen it. Then continue with the pressure washing steps above, or simply rinse the area with a garden hose. 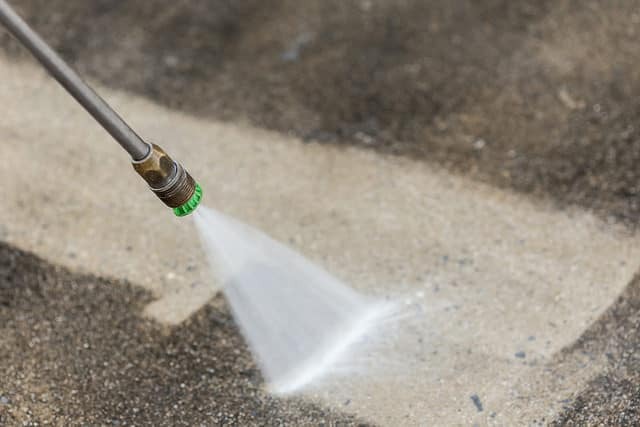 We hope that this guide to pressure washing your driveway has been useful and informative. A clean and presentable driveway is a reflection of its owner. These steps will help your driveway look as good as new again and raise its curb appeal. Thus, you may well become the envy of your neighborhood. Won’t that be nice? Happy washing! I changed my own log splitter engine oil, and I ended up getting some oil stains on my driveway. It makes sense that I would want to have it pressure washed! Maybe I should get a professional to handle it, since I don’t want to get a pressure washer just to clean my driveway once. I really appreciate your tip on how a clean driveway can instantly boost the curb appeal of your house. 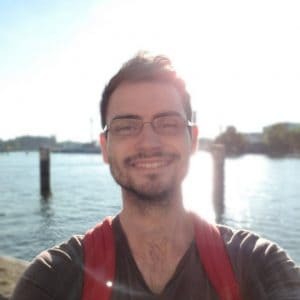 My wife and I have been thinking of getting a new house, and we are concerned that we won’t be able to attract potential buyers to our current house. I will be sure to clean our driveway so people will be interested! Yeah, that would be a good idea. Hope you get a great buyer for your house.